From Mean Girls to mermaids and Disney characters gone bad, we’ve seen some GENIUS entries into our #HallowGenius contest! Check out some of the entries so far as well as some tips on how to achieve such a genius look! If you’re trying to “get lit” this Halloween, try Glow in the Dark makeup! With an eerie glow, capture that ghostly effect for a luminous character. Kat slays under a blacklight with speckled glow in the dark paint, lashes, and even contacts! When it comes to glow-in-the-dark looks it’s all about prepping & setting! Before applying any “lit” products make sure you have a good primer, budge-proof foundation, and translucent powder! Check out more of Kat's Halloween Looks here. Meow! Nicolette brings it back with a Lisa Frank cat. We’re feeling all nostalgic over our childhood years and love her vibrant colors and stripes! Whether you own a cat or just obsessed with felines, take your “meow” to the next level by channeling a kitty-icon. With this look, black liner is your best friend. 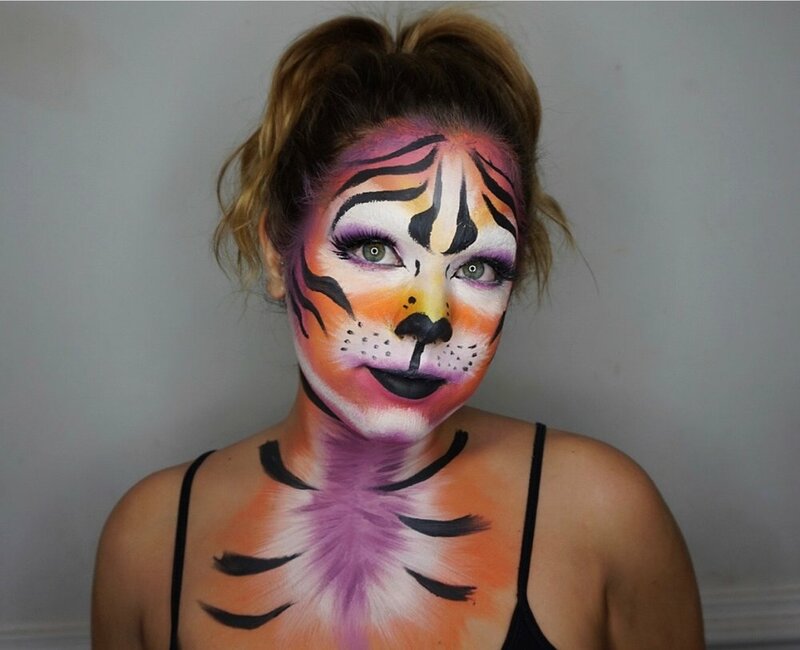 Check out more of Nicolette's Halloween Looks here. Keep it simple with this not-so-simple eye look and let your eyes do the talking. Azraelia is incredibly intricate in her work and her entire portfolio of stunning looks are true works of art. Tell a story with your eye looks, whether Mean Girls or haunted story. Tape off your edges and blend with a clean brush to make your eyes pop! Check out more of Azraelia's Halloween Looks here. Take the average black and white skull and add some pizazz. Don’t limit yourself to make up and add some sparkle! Tabetha takes “ice” to a whole new level with rhinestones and icicles in her hair. 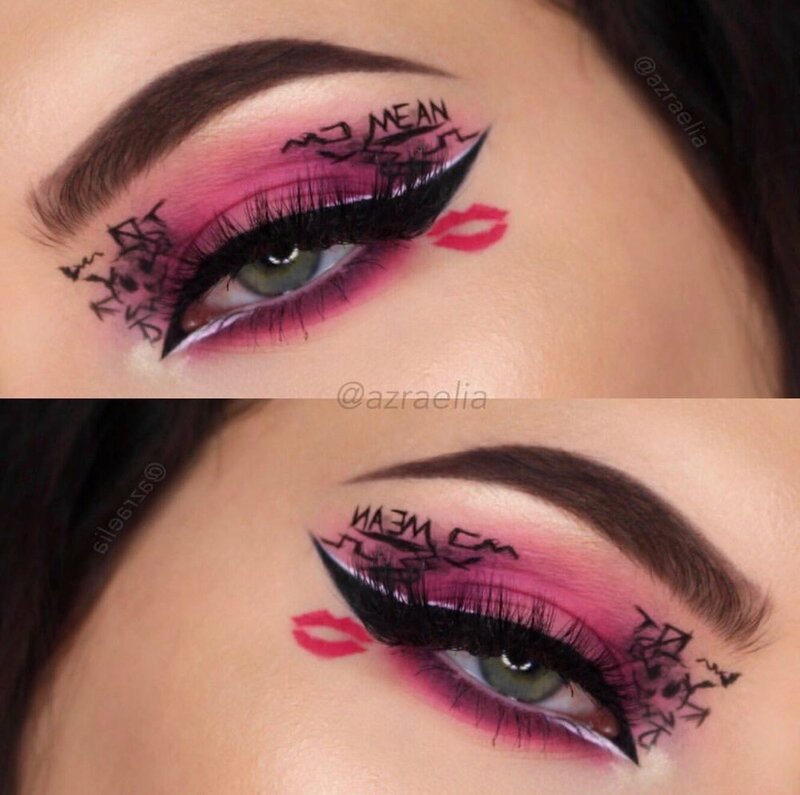 We’re shivering over her creativity and the skeleTON of looks on her page! Apply rhinestones around the eyes to enhance your costume. Make sure to place them strategically, or you'll end up with sparkle-encircled eyes that could catch light all night. Check out more of Tabetha's Halloween Looks here. If you want a more pretty look this Halloween, Angelia rules with her skull princess look. Bringing out the “sugar” in SugarSkull, think pink with a wig or colored hair spray to make sure your look steals the show. Add in rhinestones and colored contacts to really evoke “Queen of the Dead." Check out more of Angelia's Halloween Looks here. Whether you want to be Ariel from The Little Mermaid or channel your inner aquatic goddess, being a mystical queen of the ocean is a perfect costume for Halloween. Georgia uses a fishnet to blend in her perfect scales with compliments of rhinestones and pearls. Now, you can’t expect a mermaid to have hot tools to get her beachy waves, so put your wet hair in a braid, undo when your locks are fully dried and voila! Perfect mermaid hair - no trip to the ocean required! Check out more of Georgia's Halloween Looks here. We’re all aware about Disney’s actors gone bad...but what about their classic characters? There’s something to be said about dressing up as a favorite cartoon character from your childhood days but here’s Minnie all grown up…and maybe a little evil! Okay, a maybe a whole lot of evil. As we wonder what Mickey had done wrong, June uses body paint and enlarged contact lenses to take Minnie from sugary and sweet to all villain’d up. Pair the polka dots with some fake blood for a look thats more frightful than cute! Check out more of June's Halloween Looks here. Last but not least, there’s nothing more magical than unicorns - nothing. Julie takes us on a whimsical experience with her rainbow locks, a smokey sparkly eye, and iridescent jewels. 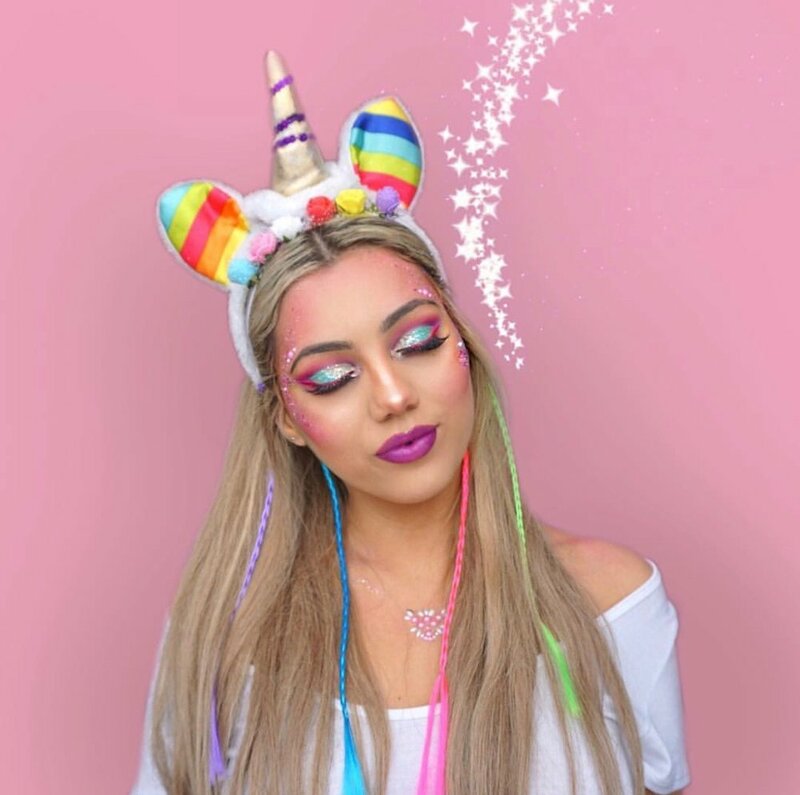 Look majestic AF this Halloween with plenty of glitter and highlighter on hand and with a unicorn horn on your head - anything else will easily go. With Julie's simple touches of makeup and hair tricks, she shows us it doesn’t take much magic to create magic! Check out more of Julie's Halloween Looks here.